Fragrant spices, fruit, and pomegranate molasses cut through the richness of the lamb, resulting in a dish that is a wondrous balance of sweet, spicy and sour flavors. Serve it with couscous for a memorable holiday dinner. You can cook this dinner on the stovetop, in the oven or even in a slow-cooker. All will produce a lamb that will be fragrant and meltingly tender. Add the garlic and onions to the pan and cook for a few minutes. Then add the tomato paste and spices. 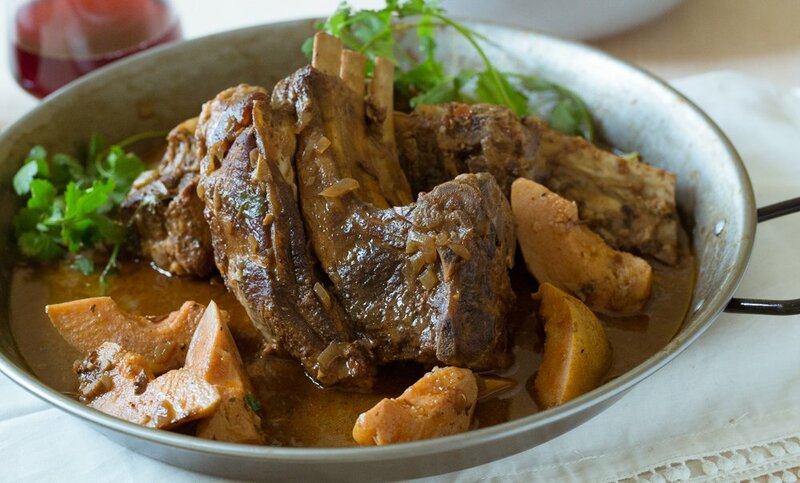 Once all is fragrant, return the lamb to the pan, with just enough hot water to cover everything. Stir in the salt and pomegranate molasses and bring to a boil. Turn down the heat and simmer gently for 30 minutes. Check on the lamb, turning if needed, and taste (and adjust) the seasonings to your liking, adding more spice if it is too mild, or pomegranate if it needs a touch more sweet and sour. Add the poached quince and cook a further 15 to 20 minutes. When you are ready to serve, garnish with parsley.